1. Put almonds, coriander seeds, pumpkin seeds, sesame seeds and red pepper flakes (if using) in medium sauté pan. Set over medium heat. Toast about 3 minutes, shaking often, or until sesame seeds begin to color. Remove from heat. 2. Fill a medium pot with water and bring to a boil. Add eggs and boil 7 minutes. Meanwhile, set a bowl filled with ice water nearby. Transfer eggs to ice bath. Once slightly cool, peel eggs and set aside. 3. In a small bowl, whisk together garlic, lemon juice and olive oil. Season with salt, pepper and extra lemon juice, if needed, to taste. 4. Gently toss watercress and herbs together in a bowl. Place half the greens on serving platter, scatter dollops of cheese over top. Drizzle half the dressing and sprinkle half the seeds over top. 5. Pile on remaining greens. 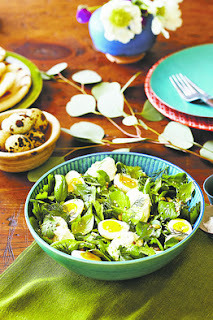 Halve the eggs and place them over and around the greens. Dot with remaining cheese, drizzle with remaining dressing and top with remaining seeds.